This is a painting I worked on with my Friday morning Drop-In class last week. 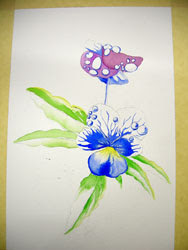 One of my students asked to learn how to paint dew or water droplets on a flower. First, I brought in a drawing ready-to-go for my students. 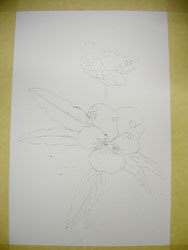 We transferred the drawing onto a 10 x 14 inch piece of Arches, 140 lb. paper. Then, we used masking tape to secure the paper to a small foam core board to keep it from buckling while we worked on the painting. 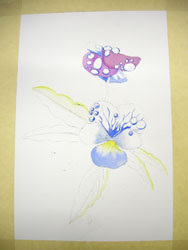 Okay, this first image of the drawing on the watercolor paper is a little hard to see. You will see better how this painting was developed as the pictures are added. 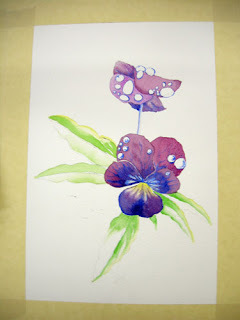 This next picture shows how we delicately outlined the water droplets and started laying in the beginning little washes. Note that the yellow wash has a very soft edge at the bottom. We accomplished this by laying in the wash, then applying a stroke or two of plain water to the edge we wanted to soften. We continued to layer in soft washes. Adding the French Ultramarine blue as an under-painting will help to make the next washes (in other colors) a darker value. It also helps to establish your setting. This is really helpful if you are working on an extremely complicated piece, the blue under-painting helps to establish the space on the picture plane so you can navigate through the picture more easily. Notice the attention that must be paid to the development of soft and crisp edges. Soft edges are painted with water. Crisp edges are pigment laid onto dry paper. Soft washes of yellow are added to the light areas of the leaves. 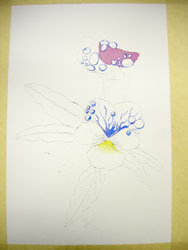 Now, the values are developed by glazing on several colors over the piece. Glazing is painting a color over a dry surface, be it clean, dry paper, or over a bone-dry color applied previously. Each glaze must be added with attention to more soft and crisp edges. As colors are glazed over other colors the depth and dimension of the painting begin to appear real. Now, as warm colors are glazed over the cool colors a real depth and realism is developed. 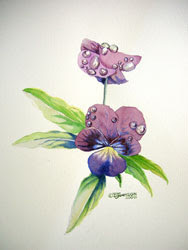 The final step will be to add soft glazes of previously used colors on the water droplets. The light source must be established so that it is relatively consistent throughout the painting. Each little droplet will have shadows and reflected light, just like a glass ball. French Ultramarine blue is glazed on the leaves to add darker shadow areas and to increase the values of some of the greens. The final painting! For my next posting, I will show some of the student's completed pieces. They really came out great! For more information on my classes click here.